After cold and potentially messy field conditions cancelled our first attempt at a practice, the Cincinnati Buckeyes and Red Stockings will again host a practice on their field at Heritage Village on Sunday, April 8, at 1:00pm. The 2018 season of 1860’s base ball for the Buckeyes’ starts the following Sunday, April 15, with a few games in Dayton, OH, hosted by the Eastwood Iron Horses. 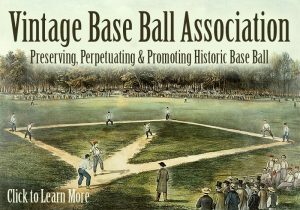 If you are interested in trying out vintage base ball for yourself, please come out on April 8 for some hitting and fielding to get a feel for the game and a chance to meet some of the players. You do NOT have to be a great ball player to play! You simply need to have a love for the history of the game, the basic ability and experience to play it, and enough free time on your Spring-Summer weekends. A non-competitive demeanor and a thick-skin are necessary as well with us. Unlike base ball of the time, we accept players from all ages, sizes, genders and ethnicities, because it’s not about WHO is playing this game, but HOW it is played. And we are in need of a few players! So please come out and give it a try! If you would like more info before coming out, please contact us. Baseball, both vintage and modern, is back once again! Huzzah!